The team behind the Natami are making progress. 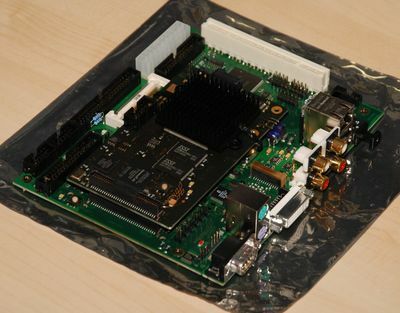 The latest news is that more MX-boards have been delivered to developers. At Sunday the 17th of July Jens, Thomas and I met and Thomas brought us 2 Natami MX boards! There will be even more boards for driver development soon. In the meantime, we will enhance the board usage documentation from a developers perspective, to make it more easy fo other devs and testers to start. When Thomas arrived, we had already prepared a HD, that started without problems connected to the Natami. Jens will also be busy with integrating his N68050 softcore into the design, which will make the still used 68060 card optional at some point. Also note the S/P Dif connector that is assembled for our boards as well as the passive CPU cooler on the 060. This looks very promising. 🙂 I think the team should be proud of the progress they’ve made so far. Now for the pictures.. Enjoy! 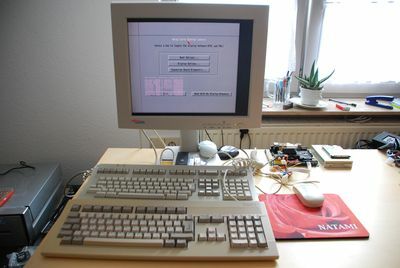 The Natami MX-board in action (taken from http://www.natami.net/blog/). Look at that awesome Natami mouse mat! I’m wishing for a “Natami”-Christmas, but only time will tell if that wish will come to life. 🙂 Anyone know anything about a possible release date? This looks very promising! Not much stuff going on at the Natami forums these days, but this is probably because the members are busy playing with their developer boards or writing software for it. I hope they will give us some information about what’s happening behind the scenes pretty soon. It’s a steady, but slow progress. My personal guess is that the boards won’t be ready for customers this year (even if Gunnar optimistically said so). Things tend to take longer in real life than they do in people’s minds. 😉 I won’t be surprised if we must wait another year. Christmas 2012 maybe? It’s positive that the members of the Natami-team are working with their developer boards. I’m still hoping for a release around Christmas, but only time will tell if that happens or not. 🙂 But you’re right, things tend to take more time in real life than in our minds. 🙂 Let’s hope for the best mate!